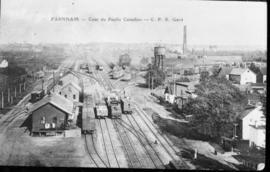 Item is a photograph of the Canadian Pacific Railway Station and yard located in Farnham, with surrounding landscape visible. 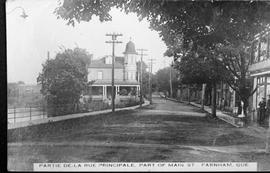 Item is a photograph of the main street located in Farnham. Item is a photograph of a dam and surrounding landscape located in Farnham. Item is a photograph of a hospital located in Farnham. Item is a photograph taken July 31, 1911, of an Eastern Townships' Bank located in Farnham, after a fire occured. Item is a photograph of a group of people standing in the rubble of a building that had burned down in Farnham on July 30, 1911. The item is a postcard with a winter view down Main Street in Farnham from about the 1910s. The item is a postcard with an aerial view of Farnham from 1913. Hospice Ste. Elisabeth Hospital, Farnham, Que. The item is a postcard of Ste. Elisabeth Hospital in Farnham from around the 1910s. The item is a photograph postcard of three men walking on Depot Street in Farnham from 1910. Camp d'été d'un groupe de soldats de la 72e batterie de campagne de l'Artillerie royale canadienne à Farnham. The item is a postcard of the St. James the Apostle and Martyr Anglican Church and cemetery in Farnham from 1908. The item is a photograph postcard of the interior of Saint-Romuald Catholic Church in Farnham from 1910. St. Paul Street, Farnham, Que. The item is a photograph postcard with a view of houses on St. Paul Street in Farnham from 1910. The file contains primary source information on the churches, landscapes and architecture of towns in West Farnham Township from 1908 to 1913. It consists of postcards with views from Farnham.